You can’t manage what you can’t measure. In this three-part series, we’ll explore the data that’s desperately needed to improve modern translation management strategies. 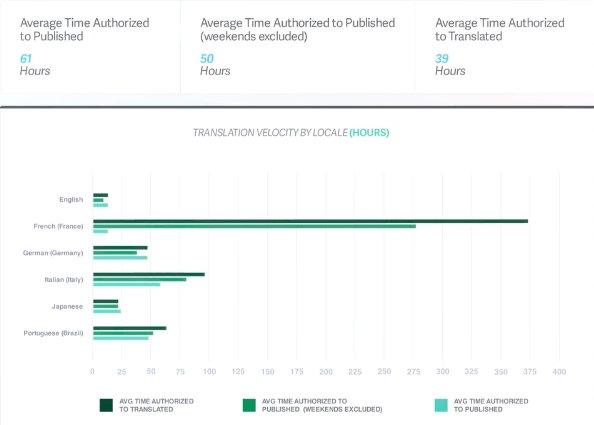 Speed seems like the easiest translation metric to understand. Unlike quality or cost, you don’t need linguistic or financial fluency in order to offer a qualified opinion. Anyone in the company can tell whether your localized content launched on-time. But confirming whether it did or did not is less important than determining why or why not. Because while the former answer offers a reactive report about an isolated event, the latter answer reveals predictive insights about a recurring process. And only one of those two helps shape future progress. This logic is not lost on modern localization managers. They always want to know which culprit could put their next translation deadline in doubt. But when it comes time to identify a suspect, many are missing the data they need to make an informed judgment. A single localized webpage is often the product of a dozen individual efforts. Content owners (and possibly web developers) have to gather and submit their text into the translation queue. Project managers have to prioritize tasks and recruit vendors. Agencies have to assign linguists and return their completed work. Reviewers have to validate quality and articulate any concerns. Then finally, project managers (and possibly developers) have to schedule the approved content for upload. When all these interdependent parts are bound together by nothing more than a loose string of spreadsheets and emails, the only evidence available for analysis is a spotty trail of timestamps. As a result, it’s all but impossible to objectively identify the weaker links within the chain. How long did the translator have to spend searching through a glossary? Is the Spanish editor always faster than the French editor? When did the reviewer actually see the document and start their work? Nobody knows for sure. And this lack of transparency becomes especially problematic when executives flag sluggish translation speed as a threat to broader business success. Having no clear data to distinguish the guilty parties, partisan finger-pointing fills the gap formerly reserved for reasoned analysis. Translation agencies are anointed as scapegoats, project managers are pitted against developers, and business stakeholders are blamed for a lack of commitment. The rise of in-fighting and decline in morale only does further damage to team performance, prompting managers to either replace vendors or relax deadlines in an effort to bring peace back to the tribe. All the while, the original offender who caused this chaos remains at large. Rooting out translation inefficiencies requires a detailed perspective of all the underlying activity. The process has to be understood as deeply as its product if you’re ever going to separate truth from suspicion. Even if you could retroactively sift through every email and build a credible case on the delayed delivery of a particular webpage, that’s not a tactic you can replicate across a 250,000-word website translated into four languages. The only scalable strategy is to deploy machines that can do your bidding for you. A cloud-based translation management system has all the right credentials for the job. It centralizes team activity to ensure visibility, associates data with every action, and facilitates sophisticated analysis. With these new investigative insights in your arsenal, entirely new lines of inquiry suddenly reveal themselves. Who are your fastest and slowest translators? What types of content take the longest to complete? Which workflow step tends to be the biggest sticking point? The resulting answers will finally create an objective set of benchmarks to work from. Instead of lamenting how long a job might take, you can see that similar content is usually completed in 58.6 hours and plan accordingly. Instead of fretting over a high-priority deadline, you can swap in your fastest translator to take on the special assignment. These predictive capabilities alone can bring a welcome dose of sanity back to team operations, but the ultimate value of data is the power to start shaping the future that you see. Gradually setting more aggressive deadlines for content handled by your fastest workflows. Strategically eliminating workflow steps that don’t add enough value to justify the time invested. Confidently confronting vendors with evidence of their comparatively slow turnarounds. These are the higher-order, data-driven decisions translation teams need to start making if they want to deliver dramatic results. Sometimes the only way to understand something is to see it for yourself. Let us know what answers you’re looking for and we’ll set up a demo specifically designed with your needs in mind.